Dr. Mansur Khan, one of UMMA Clinic's founding members, attends the 2009 White House Iftar on behalf of UMMA Community Clinic. Dr. Mansur Khan is one of the founders of the UMMA Community Clinic. 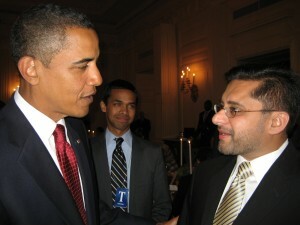 Dr. Mansur Khan attended the 2009 White House Iftar on behalf of UMMA Community Clinic. This page was last modified on 17 April 2018, at 00:29.